The evolution of Cuidiú formerly Cuidiú - The Irish Childbirth Trust, is difficult to put into words. There wasn't one "big bang" to herald its creation. Instead there were clusters of women in the 1970s who were blessed to encounter pioneering Antenatal teachers such as Maeve O'Callaghan in Cork and Aileen Henderick in Dublin. Here is an extract of an account by Amelia O'Connor outlining the origins of the Cork branch. "It begins with Maeve O'Callaghan. Maeve, an Antenatal teacher in Blackrock, was helping young parents to prepare for childbirth. She could see the benefit young mothers would gain from being in contact with one another and so she encouraged some of her enthusiastic 'Past Pupils' to set up a branch of the London based N.C.T. The original small group, some of whom had attended Maeve's classes in 1979, met and clicked straight away. We discovered that we shared a mutual concern about childbirth and its importance in the life of the couple and also within our society. There was concern that childbirth should be an empowering experience for a woman, not just something to be 'gone through' and managed by others. It was felt that we should have choices in the way we give birth." 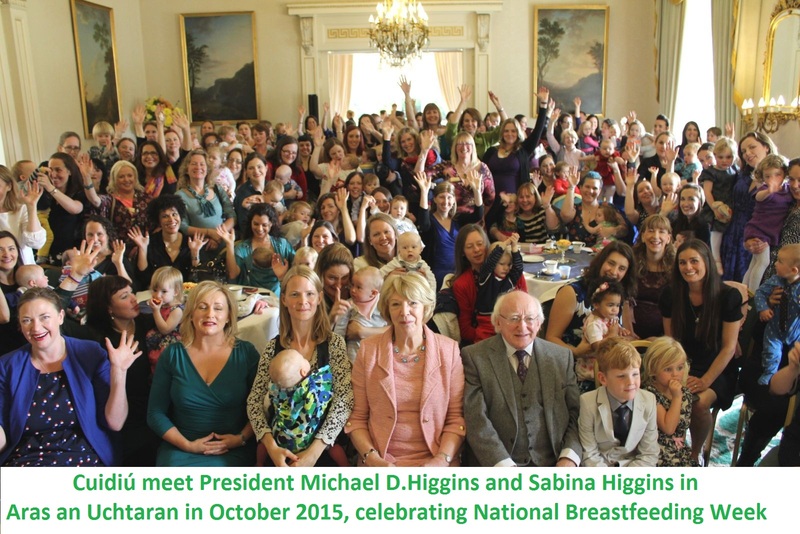 In Dublin, Aileen Henderick used her expertise from her involvement in the National Childbirth Trust in Britain, to set up NCT Dublin. This one group later split into three different geographical areas, Dublin South-East, South-West and Dublin North. In February 1983 the first council meeting took place in Cork. Aileen Henderick was elected President. Her presidential successors have been Deirdre Martin, Brenda O'Malley Farrell, Sue Jameson, AnnMarie Smith, Paula Gahan, Geraldine Cahill, Catherine Wells and Nicola Reeves, our current President. Over the years branches have evolved in many different ways - some faded in particular areas, other got a new lease of life and reformed again, others grew so much that they split into a number of branches. We are always interested in supporting new branches in any part of the country. Cuidiú has gradually developed into a formal structure with 24 branches and groups around the country offering a diverse variety of support services to Parents. Branches have evolved differently according to the interests and expertise of their membership but the ethos of every branch is overseen and directed by a central board of directors and members of teaching panels for Antenatal, Breastfeeding and Parenthood support. Each branch has its own committee to organise and run its events. Some branches produce their own newsletter and host their own local Cuidiú websites. All branches and groups have an active Facebook presence. In 2009 the Charity Act was enated and because of this Cuidiú had to change its stucture to adhere to new governance and legal requirements for a Chairtable Organisation in Ireland. Council worked hard to put a new legal and structural framework in place. In Februray 2016 the Members voted to change disolve the previous Trust status and become a Complany of Limited Guarantee (CLG). We now operate under a Board of Directors and an Adminstrative Council made up of members of the CLG. This gives Cuidiú a stronger framework to operate from in the future. However, consistently the backbone of Cuidiú has been made up of amazingly dedicated volunteer parents who train as Antenatal Teachers, Breastfeeding Counsellors, Parenthood Supporters and/or who have served on local branches as committee members. Our aim remains the same - to provide information to parents which allows them to make informed choices about childbirth, breastfeeding and parenthood. 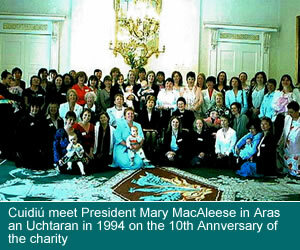 The following is a poem explains very well what Cuidiú is all about and was presented to President Mary Robinson during a visit to the President's Residence Aras an Uachtarain on 7th February 1994 to celebrate our 10th anniversary. A collective shoulder to lean on. The holy work of living.